NEW YORK -- The mother of Eric Garner, whose pleas of "I can't breathe" in 2014 became a rallying cry against police brutality, said Thursday she "felt sort of numb being in the same space as my son's murderer." 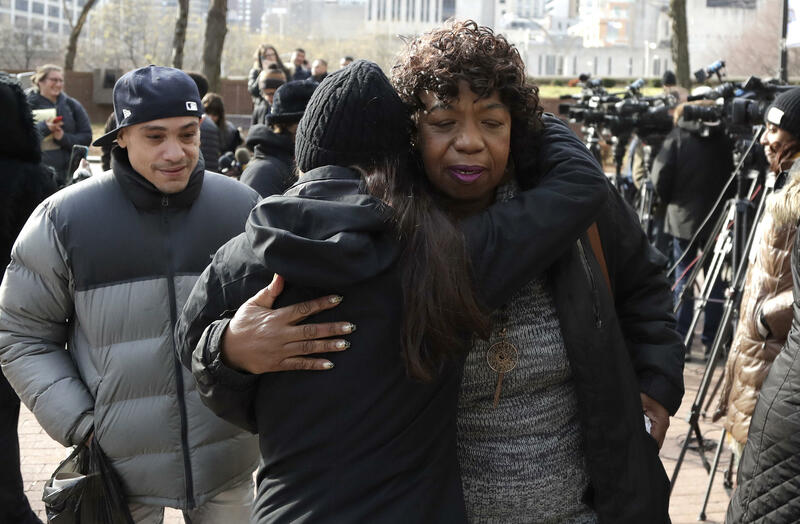 Gwen Carr made the remark after an administrative judge announced during a brief hearing that the New York City police officer accused in Garner's chokehold death -- Daniel Pantaleo -- will face an NYPD disciplinary trial next May. The judge rejected demands from Pantaleo's lawyer to delay the officer's department trial in Garner's death until July, when time runs out for federal prosecutors to file civil rights charges against him. Pantaleo, wearing a dark suit, didn't speak during the hearing at police headquarters and lingered in the trial room with his head down as a crowd, including Garner's relatives, emptied out. Garner's mother said she wants the police department to fire Pantaleo and others who were involved in her son's arrest. Pantaleo, who is white, is charged with reckless use of a chokehold and intentional use of a chokehold in Garner's July 2014 death in Staten Island. If convicted, the 33-year-old Pantaleo could face punishment ranging from the loss of vacation days to firing from the department. He was stripped of his gun and badge and placed on desk duty after the incident. Garner, a 43-year-old father of six who was unarmed, could be heard on an amateur video shouting "I can't breathe!" as Pantaleo placed him in an apparent chokehold after officers stopped him for selling untaxed cigarettes. Garner suffered a heart attack in an ambulance and was pronounced dead at a hospital. Pantaleo's lawyer, Stuart London, said the officer used a takedown move taught by the police department, not a banned chokehold, and will be vindicated. His union issued a statement blaming the 350-pound Garner's poor health and resisting arrest for his death. "This case demonstrates the danger that is inherent in prejudging incidents absent all of the information that must be considered in order to come to a truthful and accurate conclusion," union president Patrick Lynch said in a statement. "We can't listen to the noise," he said, CBS New York reported. "Let us listen to the evidence. We are going to bring before us evidence that Officer Pantaleo did exactly what he was trained to do." Pantaleo's union, the Patrolmen's Benevolent Association, said the officer had used "the least amount of force necessary" and that Garner couldn't have been subjected to a chokehold because his autopsy showed that his windpipe and hyoid bone were intact -- an assertion the medical examiner said was wrong. The city's Office of Chief Medical Examiner pushed back at Lynch's comments, saying that it stood by the original forensic investigation and determination, which found Garner died from injuries including neck compression. The NYPD decided in July to go forward with disciplinary proceedings, saying it was running out of patience with the federal government's indecision about whether to bring a criminal case. A state grand jury on Staten Island chose not to indict Pantaleo after Garner's death four years ago.